The ITH Spool Quilt Block comes in two sizes, 3" finished and 6" finished. Each is done in two hoopings. 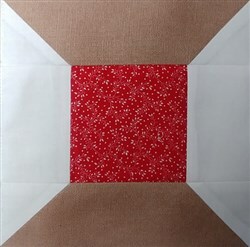 Please see the "Sewing Tool Wall Caddy" for block sewing instructions. Ramona Baird is happy to present ITH Spool Quilt Block machine embroidery design which has 1116 stitches and is [88.90 mm x 89.41 mm] large. If you would like to view more embroidery patterns please search on our embroidery designs page.